seeds are edible after drying, popping, or frying, and can subsequently be ground to flour. seeds can be taken from dried capsules. rhizome is edible after prolonged boiling with several changes of water. rhizome can be roasted or boiled, then peeled and either eaten or thinly sliced for drying and then either stored or ground into flour . 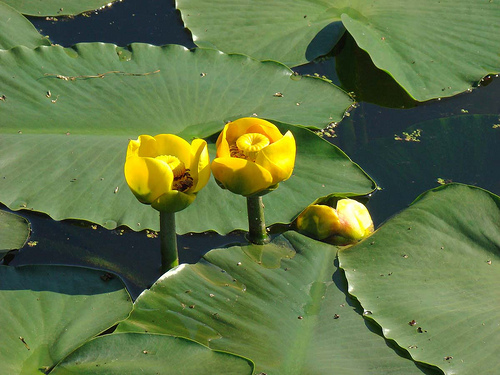 the variety in Ontario is Yellow cow-lily (Nuphar lutea). grows in shallow, calm water in plains, montane, and subalpine regions. warning: eat in moderation, large amounts may be poisonous.